GSM (Global System for Mobile communication) provides a service to more than 500 million users throughout 168 countries worldwide. It is the world market leader serving 69 % of all mobile digital users and is currently evolving into UMTS (Universal Mobile Telecommunication System). By describing the critical decisions and the phases of the development this key text explains how the GSM initiative became a success in Europe and how it evolved to the global mobile communication system. Initially the strategy and technical specifications were agreed for Europe and the subsequent evolution to a global solution was achieved by incorporating all non-European requirements and by inviting all committed parties worldwide to participate. The process started in 1982 and the first GSM networks went into commercial service in 1992. The first UMTS networks are expected in 2002 and the fourth generation discussions have begun. The accompanying CD-ROM provides nearly 500 reference documents including reports of all standardisation plenary meetings, strategy documents, key decisions, the GSM Memorandum of Understanding and the report of the UMTS Task Force. Friedhelm Hillebrand is the Managing Partner of Hillebrand & Partners Consulting Engineers in Germany. Fred founded Hillebrand & Partners in 2001and prior to that he held leading positions in ETSI. From 1996-2000, he was Chairman of ETSI SMG, which is responsible for all GSM and UMTS standardization work. Before that he was a Technical Executive at GSM MoU Association responsible for GSM and UMTS evolution and development strategy and GSM promotion at global level. He is described as one of the Fathers of GSM. The Agreement on the Concepts and the Basic Parameter of the GSM Standard (Mid-1982 to Mid-1987) (Thomas Haug, Philippe Dupuis and Stephen Temple). The Detailed Specification Work Leading to the GSM Phase 1 Standard used for the Opening of Service (1987-1991) (Thomas Haug). Consolidating GSM Phase 1 and Evolving the Services and System Features to GSM Phase 2 in ETSI SMG (1992-1995) (Philippe Dupuis). Evolving the Services and System features to Generation 2.5 by the GSM Phase 2+ Program (1993-2000) (Phillipe Dupuis, Friedhelm Hillebrand and Ansgar Bergmann). GSM Goes to North America (Don Zelmer). The UMTS Related Work of the European Commsiions, UMTS Taskforce, UMTS Forum and GSM Association (Joao da Silva, Ruprecht Niepold, Bosco Fernandez, Thomas Beijer and Josef Huber). The UMTS Standardisation Work in ETSI (Philippe Dupuis and Friedhelm Hillebrand). The Third Generation Partnership Project (3GPP) (Karl Heinz Rosenbrock and Niels P.S. Andersen). Services and Services' Capabilities (Friedhelm Hillebrand and Alan Cox). System Architecture Evolution (Michel Mouly). Radio Aspects (Didier Verhulst and Michael Färber). The Subscriber Identity Module: Past, Present anf Future (Klaus Vedder). Security Aspects (Mike Walker and Timothy Wright). Short Message and Data Service (Friedhelm Hillebrand, Kevin Holley, Wolfgang Roth and Jürgen Baumann). Mobile Stations Type Appproval (Remi Thomas and David Barnes). Operations and Maintenance (Gisela Hertel). Professional Technical Support and its Evolution (Bernard Mallinder, Ansgar Bergmann and Adrian Scrase). Working Methods and their Evolution (Ansgar Bergmann). The Contributions of the GSM Association (Renzo Failli, George Schmitt, Arne Foxman, Petter Bliksrud, Armin Toepfer, Michael Giessler and Neil Lilly). 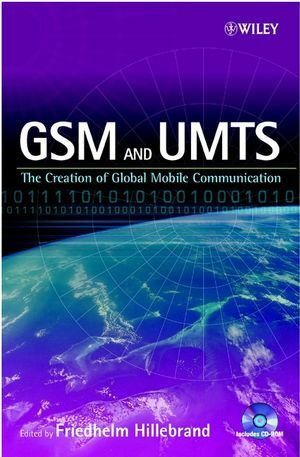 GSM and UMTS Acceptance in the World (Friedhelm Hillebrand and Bernd Eylert). GSM Success Factors (Friedhelm Hillebrand).